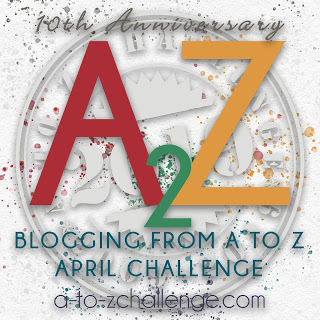 So, Basically, beginning with April 1, my topic will be themed on something with the letter A, then on April second another topic with the letter B as the theme, and so on until I finish on April thirtieth with the theme based on the letter Z. I am number 778. I was probably quite young when I first learned about astrological signs of the zodiac, perhaps a teen. I think my mother believed in such things because she always read her daily horoscope. Actually the general characteristics most often used to describe people who share my sign, fit my personality rather well. I wondered if my sign would be significant in any way in my life. It turns out that it has. One time, when I was around nine or 10 years old, I was hanging around the adults who were lingering at the dining room table after a family get together. True to my sign I was probably quietly unnoticeable. Strange that I can recall the tone and gist of the conversation so many years later. But I am sure that's because I remember feeling scared as I listened to the adults talking in hushed tones and shaking their heads as they described what happened to Aunt Til. I remember being obsessed about it for several years, because I was afraid the same thing would happen to me. I didn't understand too much when Aunt Til was affected. She was still my Aunt Til. I was in my early twenties when it happened to my grandmother. But grandma still made sure to tell me that I had to have something borrowed, something blue, something old, something new, on my wedding day. When it happened to my dad, he wasn't the same. He screamed and yelled. I lost my patience and told him to behave and he pushed me out of the way. I wondered why no one was doing anything to help my dad. I began to hate my sign and called it evil. There have been so many, too many who have suffered the evil. People walk, run, swim and ride bikes. They sing and dance. They host dinners and luncheons. They call on the phone and go door to door. They proclaim months of awareness and assign colors for pins, tee shirts, hats and rubber bracelets. And still the evil prevails. Three years ago, just around this time, my mom started her battle with the evil. I wondered why no one was doing anything to help her. In January of 2010, the evil found my son. On December 5, 2011, the evil killed him. And I wondered why no one could do anything to help him. By nature, my home and my family are the center of my cares and concerns. When one becomes close to me I will look upon you and treat you as one of the family. But if you hurt or offend me, I may view you as an enemy. I have a deep inner world filled with considerable passion and understanding. In order to become part of my inner world one has to prove one's trustworthiness. At times I can be irrational and quite moody. On these occasions it is best to leave me alone until the mood passes. I inherently know what will make another person happy, so just allow me the time and the space to bestow my gifts to you. By nature evil comes into your home and indiscriminately picks a member of your family without care or concern. When evil comes close to you it will treat you cruelly and painfully. It will hurt you and your body becomes the enemy that evil must destroy. Evil has a deep inner world empty of passion or understanding. It is always irrational and moody. On occasion, it may be best to leave evil alone until the mood passes. But I know that in time the walks, runs, pins and bracelets will be the gifts that destroy the evil that is cancer. Thank you for your thoughts. It's nice to hear that cancer can be controlled and cured. Such a powerful piece, Lynda. Thanks for sharing it with us. Oh, that is beyond horrible! I'm so sorry to read this. Cancer has entered my family in different forms, but I've been fortunate in that many of the individuals are still with me. This was so very sad. The evil takes too many from us.